Our faculty-led study abroad programs allow us the privilege of meeting and working alongside outstanding educators and faculty members from all around the world. Together we set out to design and facilitate unique programs that will challenge and transform the students on their journey abroad. Elizabeth Ferguson, a faculty member from George Mason University, is such an educator. 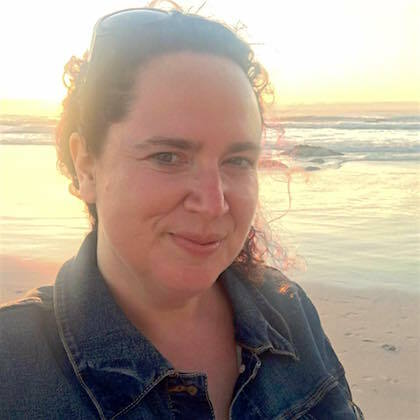 She lectures in composition and professional writing and leads an annual study abroad program to South Africa: Social Movements in South Africa (English 488: Topics in Writing and Rhetoric). What motivated you to design and lead the Social Movements faculty-led program in South Africa? “I was motivated to start and run this program after teaching at Nelson Mandela University in Port Elizabeth, South Africa for a semester in 2014. I had been interested in South African politics since I was young. When I finally got the opportunity to live and work in South Africa, I realized the vast gap between what I knew before I got there and how much I had to learn about South Africa’s history, people, and many cultures. Additionally, I realized how there is no substitute for learning all of those things while on the ground and in the country. Elizabeth’s graduate degrees are in Rhetoric and Composition and her course is framed through these disciplinary canons (e.g. delivery, embodiment, invention, or memory). According to Elizabeth, the initial focus of her course was to try and bridge the social movements in South Africa that worked to end Apartheid, with those that currently exist in its vibrant democracy. With each annual program this evolved to focus more on current social movements (i.e. Fees Must Fall, labor movements, women’s equality, and LGBTQ rights) within the context of anti-Apartheid social movements. “During the course students examine how action happened at various points during the protests against Apartheid and consider actions currently taken in the current social movements. They will examine the ways food, music, and dance are communicated to outsiders as embodied experiences and how the government as a source of invention, in its various forms, created and re-created South Africa through laws. Memory is how a culture has memorialized its past. Memory and invention are closely tied together because culture is invented and grows out of a public and private memory of the past. By using the canons of rhetoric students are able to explore the sites and experiences within South Africa using a broad lens. How does the study abroad experience in South Africa ad value to this course? How do you ensure this program successfully runs and improves each year? “Planning is the key to success for a study abroad program like the one I run. This is an intense, two-week program and I want to ensure that students have a quality educational experience during their time in South Africa. At my university the program planning takes place directly after I get back from South Africa in January. A key aspect to planning for the success of a program is making notes as the program is happening. I incorporate this type of reflective practice in my classroom teaching and find it quite helpful for my study abroad instruction as well. By taking notes as the program is underway I am able to look back at a real-time account for what worked well, what did we change in the moment, how did students want to spend their free time, or even where did we decide to eat while we were close to a particular site or location. All of these notes help me plan my next trip. Each program I have run was different from the one before. How do you recruit students for this program? “Our study abroad program office holds a fair for programs to recruit in the spring and in the fall semesters. Those study abroad fairs get interest up and help students plan for the programs they are interested in pursuing. How does a Faculty-led study abroad program benefit the participating students? Thank you for sharing your experience and expertise, Elizabeth. See you next year! If you are interested in learning more about South Africa from “the inside out”, take a look at our customizable Faculty-led programs in South Africa. Elizabeth is a PhD candidate in Writing and Rhetoric at George Mason University (GMU), where she studies the rhetoric of epidemics, international technical communication, and crisis communication. She is a founding member and current President of the GMU student chapter of the Society for Technical Communication (GMU STC).